Years ago, we took our children to Washington D.C. for a Spring Break trip and while we were there we visited the National Cathedral. It’s beautiful. High vaulted ceilings. 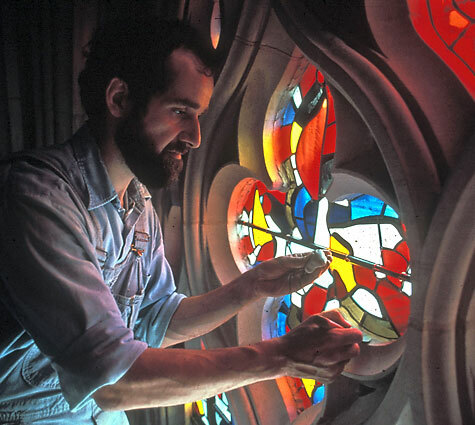 Intricate stained glass in large lovely windows. Even the smallest detail seemed carefully planned and wrought for grandeur. 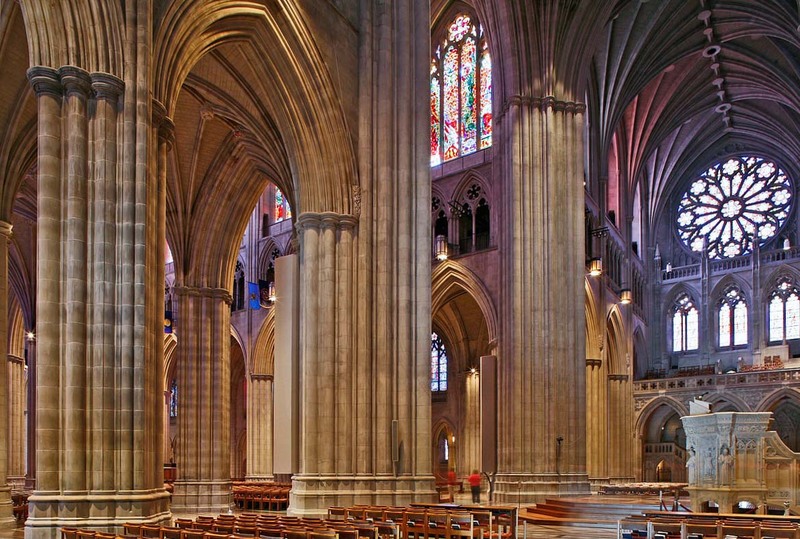 As we walked through the National Cathedral, our fourth grader stared with wide-eyed wonder. “Why did they make it so big and fancy?” she wondered. Her question took me aback for a moment; I wasn’t sure how to answer since the extravagance of the architecture was new and different for me as well. But then I had an insight: an important insight for my journey into a bigger world of faith. I answered: “Because they believe God is worth it. They want to build something very beautiful and majestic and large because God is beautiful and majestic and huge. Psalm Surely something similar was going on when Israel built the Tabernacle. This story in the final chapters of Exodus describes the people paying attention to every detail; crafting beauty with every turn of their lathe and twist of their spindle. This traveling sanctuary was completely utilitarian, but everything was built with such care and passion and attention to beauty that it must have been breath taking. The Tabernacle sounds extravagant to me. The word “extravagant” has taken a bad rap, I think. But the way I use it here describes an understandable outpouring of passionate generosity. I’ve been wondering about passion this week. Where does it come from? How does that happen? Like the mystery of springtime, what is it that stirs a soul and quickens life? And what happens to cause a lack of passion? A wise mentor once taught me that the opposite of love is not hate; the opposite of love is apathy. When we don’t care, when our hearts cannot be moved, when we are content to sit in our small complacency – this is dangerous; this is insidious. “The self curved in on itself” so that the heart begins to lose its ability to expand and be moved with compassion for the other. The Self begins to lose its ability to open itself up to God. But this Tabernacle story is a good example of hearts wide open with extravagant generosity. For all the stories we hear about Israel whining and complaining and resisting, here is one lovely story about when they got something really, really right. I’ve been thinking about passion this week and I’ve pondered what God’s people of old might teach us modern folks about the extravagance of generosity. The story tells us that God raised up leaders and gifted them with creativity and competence. “They had been given skill by the Lord,” the text says. They were called by God and by Moses to motivate and demonstrate excellence. These inspired, visionary leaders led with passion. Another thing this story tells us is that the entire community created a culture of generosity. There are plenty of stories that describe the complaining of the Israelites as if it were some sort of epidemic. Someone starts criticizing and then before you know it, everyone around her is infected. Pretty soon the whole community is grumbling about one thing and then another. It’s as if the ethos of an entire community becomes a culture of complaint. But in this story, the culture the Israelites created was for gratitude and goodness and generosity. The hearts of some were stirred, then pretty soon, there was an epidemic that infected the entire community with joy and generosity; they were fevered with enthusiasm. I like the way Exodus describes all the different skills and offerings and gifts. Planning and organizing, carving and weaving, working with metal, wood, fabric and precious gems: everyone had something to do; everyone had something to give. The people understood that each one of them had something significant to offer and they believed that what they were doing together was important. It was important; this work they did together as a people really mattered. Working together on this hugely important Tabernacle project helped form them as a people and defined who they were and whose they were. In the building of the Tabernacle, they came to understand themselves as a people who worshiped this God who had called them into being and called them into relationship. The naming of relationship is the cornerstone for the entire Law. Remember the very first words of the Ten Commandments remind: “I AM the Lord your God who brought you out of the land of Egypt, the house of slavery….” (Exodus 20:2). And so here, in this story, the people’s hearts were stirred because of this key relationship. They were moved and motivated by their gratitude to the living Lord. Their actions were a response to the self-giving God who had rescued them from Egypt. Do you remember when you were madly in love? Can you recall when you wanted to give, give, give to your beloved and how that giving gave you such joy? Remember how your extravagance simply reminded you how precious this relationship is; how giving only made you wish you could give more? When we are truly in love, our hearts are stirred. I’ve been thinking about passion this week and I wonder: how do we lose it? How is it that our love can become so conservative, so careful, so cool? How does that insidious apathy creep in so that the culture of an entire relationship becomes small minded and hardhearted? If you’ve been reading through Matthew this week, you’ve recognized the abundant extravagance of Jesus. When Jesus reinterpreted the Law, he called for an extravagant generosity, grace and welcome among brothers and sisters, for the stranger among us, and even for our enemy. When Jesus described the kingdom of heaven, he used extravagant images of God’s grace breaking into the world and permeating everything like yeast in dough. When Jesus went about healing, he created an extravagant outpouring of God’s wholeness and shalom within lives that were broken and fragmented. There is no hint of apathy in Matthew’s Jesus. His heart was stirred to extravagant generosity. Even in the wonderful little story of the Transfiguration in chapter 17, there is a vision of extravagant glory that tore open the mundane settledness of the disciples’ world and poured into their lives as they stared with wide eyed wonder. And did you hear Peter’s response? Surely this was an extravagant response: building three tabernacles – not just one! But the voice is clear: THIS is the Son, the Beloved. Listen to him! This is the One who has been sent to show us how beautiful and majestic and large and extravagant is God’s love for us. And this is the One who continues to show us God’s glory. 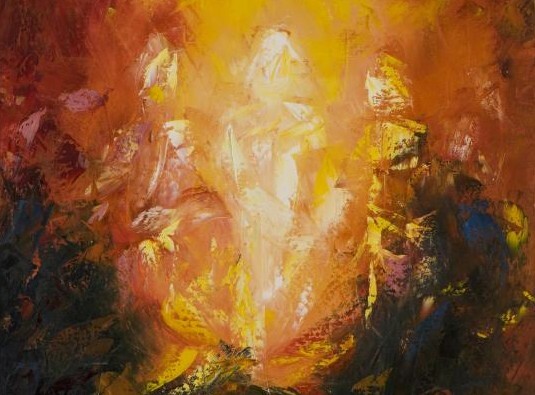 And so now the Transfigured Christ is ever seeking to transfigure us; the Spirit of the Risen Christ is still working to transform us “from one degree of glory to another” (2 Corinthians 3:18). When hearts are stirred and transformed into the image of this Christ, then extravagant self-giving becomes the mark and the sign; the culture and the calling of the people of Christ. Next Next post: As You Read. Week 11. Tabernacle.